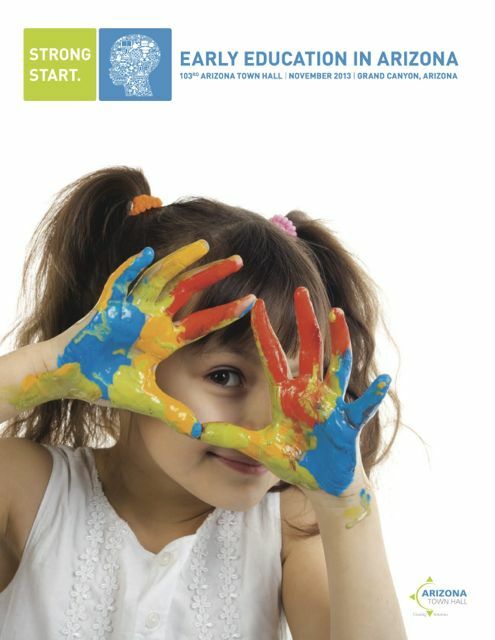 On Thursday, November 7, at 5:30 p.m., Arizona Horizon's Arizona Town Hall's President Tara Jackson, and Todd Sanders, President and CEO of the Greater Phoenix Chamber, were interviewed on the recommendations from the Early Education Town Hall. Watch it on Eight's website. Activities: Monday's lunch program speaker was Adele Diamond, Professor of Psychiatry at the University of British Columbia and the Canada Research Chair in Developmental Cognitive Neuroscience. Monday's dinner program speaker was Rob Grunewald, Associate Economist at the Federal Reserve Bank of Minneapolis. (Read a recent Q&A with Rob Grunewald that appears in the just published issue of the ASBA Journal.) Tuesday's lunch program featured presentation of the Shirley Agnos Arizona Town Hall Legacy Award to John Haeger, President of Northern Arizona University. In addition, there was special entertainment by the Northern Arizona University School of Music Students. Trinity Donovan, Jennifer Frownfelter, and Emma Gully. Chair Dave Howell and Recorder Laura Sixkiller of Panel Yucca. George Miraben and Rebecca Timmer. Special entertainment provided by Northern Arizona University School of Music students. Shanna Kukla, Laura Sixkiller, Betsy Peck, and Jaymie Jacobs. Stella Carr, Aubrey Durham, and Karen Ortiz. John Haeger, President of Northern Arizona University, awarded the Shirley Agnos Arizona Town Hall Legacy Award by Shirley Agnos. Casey Rooney and Scott Rhodes. Shirley Agnos and John Haeger. Mary Beth Turner, Lucille Watahomigie, and Char Imus. Aubrey Durham, Recorder Gus Schneider, and Chair George Miraben of Panel Hedgehog. Monday evening's featured Speaker Rob Grunewald. Torri Anderson, Patty Merk, and Anne Babinsky Rawlings. Tom Slonaker and Len Kirschner. Bob Strain, Cory Underhill, Chet Hedden, La Vonne Douville, and Jane Strain. Gina Villareal and Mayra Chin. Len Kirschner, Scott Rhodes, and Barry Williams. Emma Gully, Casey Rooney, and Rebecca Timmer. President Tara Jackson and Madeline Loughlin. Tammy Lynn McConahay and Kim Winzer. Shanna Tautolo, Roxanne Thomas, and Marty Shultz of Panel Ocotillo. Char Imus, Mary Beth Turner, and Tannya Gaxiola of Panel Cholla. Recorder Emma Gully and Chair Rebecca Timmer of Panel Cholla. Recorder Jennifer Frownfelter and Chair Casey Rooney of Panel Saguaro. Todd Sanders and Sandy Merz. Dee Tamminen, Mayra Chin, and Julie Torres.